why haven’t you seen this movie? The King’s Speech was my favorite movie of the year. I cannot wait until it is on DVD/BluRay. 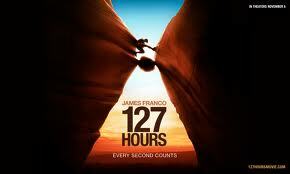 However, I am desperate to talk about 127 Hours with someone who has actually seen it. Seriously. I still think about this movie and I saw it weeks ago. It was the only time I’ve ever seen a movie and walked out exhausted by the emotional roller coaster I’d been on. But, like a roller coaster, I walked out majorly excited. I mean, it was a phenomenal movie. My guess is that the main reason people haven’t watched it is the whole cutting-off-his-own-arm scene. I am NOT good with gore. In fact, there was a point in this movie that I was pretty close to closing my eyes, covering my ears, and humming loudly. BUT, if I hadn’t gone through it, I probably wouldn’t have had the amazing experience I did. My hope, with this post, is to encourage you, if you haven’t seen it, to go rent it/buy it/download it *I would never encourage anyone to illegally obtain a movie* or whatever method you can find to watch this movie. The yucky part is about three minutes, but the rest is so completely worth it. Is that not the reason?